As usual, it was a very busy week. My mother had thyroid surgery and I took the day off on Wednesday to be with her at the hospital. I thought she was coming to my house that evening but I had misunderstood. She was going to spend the night at the hospital and I would pick her up on Thursday. I decided to go in to work in the afternoon since it was a 45 minute drive back home verses a 15 minute drive to work and I wanted to go back to the hospital after the surgery was over. I answered some emails and tried not to worry about my mother until the doctor called and said everything went well. After work I went back to the hospital and my mother was not a happy camper. She was in a lot of pain so I got the nurse's attention and stayed until mom fell asleep. I felt like I should stay and watch over her but I had to work the next day so I went home and hoped the nurses took care of her. On my lunch break on Thursday, I drove over to the hospital and my mom was dressed and ready to go to my house. We stopped to pick up her prescription and then went home. She took a nap and I went back to work again. It sure would be nice to not have to work so that I had time to help my mom but I guess I still need the money. So, my mom was feeling better every day and we went grocery shopping at the organic market on Saturday and I stopped at the pet store. It was still quite hot outside but I only had 2 goals for the weekend, grocery shopping and planting my 2 new trees. I bought 2 chinese pistache trees from the electric company. They are only $8 each. Such a bargain. I bought 3 last year and they are doing great. Some day there will be a lot of shade in this yard (like there was before I cut the two chinaberry trees down). There are now 7 low water trees in the backyard. Someday I will stay in one place long enough to watch my trees grow up. 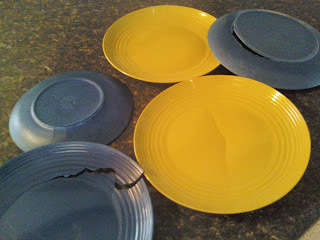 In other news, I noticed my plates looking uneven as they were stacked on the shelf. Turns out a bunch of them cracked all at once. I suspect it was because the weather was humid and now it is very dry. These plates are made out of ground up bamboo or something like that and the backs of them were not sealed. They absorb water and then crack. I bought a few replacement plates this Summer and I noticed that the backs are sealed now. I hope the new bamboo plates last longer than 1 year. I took my mother home this morning. It was funny because I bought her flowers and she kept asking if the lilies were going to open. I wasn't sure if they would open but this morning they opened (I should have taken a picture). I told my mom that is was ok to go home now that the lilies had bloomed. Try not to fill her full of sugar, like you did with Dad! Of course not! Oh wait, she was eating ice cream here and then went home and bought more. I'm a bad influence!